HarperChildren's Audio completes its latest set of recordings of C.S. 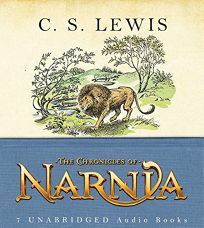 Lewis's The Chronicles of Narnia, now available as a stylish boxed set. In 2004, Jeremy Northam and Patrick Stewart were the latest British Shakespearean actors to lend their voices to the classic fantasy series reading The Silver Chair and The Last Battle, respectively. Other previously recorded performers on the collection include Kenneth Branagh, Michael York and Lynn Redgrave. .